When cooking high steaks meat, there are two things to note: firstly, our meat is a little different to what you will buy from a supermarket, and secondly, each cut has its own characteristics and should be treated differently. Most supermarket meat comes from feedlots, where the animals are confined and fed a formula diet. When animals choose their own diet, they eat for health, rather than for fast weight gain, so comparatively, meat from a supermarket will be soft and sloppy and contain a lot of fat but little texture. High Steaks beef and lamb comes from healthy animals who are exercising as they forage. Our meat is lean and tender, with a firmer texture, it will exhibit marked variation in the texture of the different cuts. There will also be seasonal variation in the texture, flavour, fat content and the colour of the muscle and fat. In autumn, as the animals prepare for winter they will store fat; by early spring, they have used up that fat and are very lean so you will have to adapt your cooking throughout the season. The different cuts of beef and lamb are what provides the enormous variety in dishes that can be cooked. The important factors are how hard the muscle works and the amount of connective tissue it contains. So in the end it’s all about how you cook it. The back of the animal (rib and loin) does very little work. There is little connective tissue and these cuts are best suited to quick, dry cooking (eg. roast, BBQ or fry). 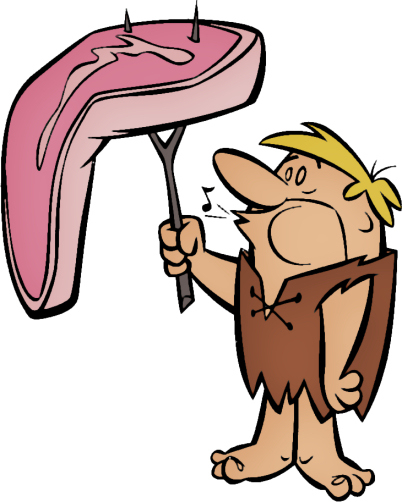 As our meat is lean, be careful not to dry out the meat by cooking too long. Resting is all important after all high heat cooking methods, rest for at least 1/2 the cooking time. The rump is harder working than the back muscles, it has longer fibres, with more texture, but little connective tissue so is still good for grilling, but also suited to stir-frying and really, anything you can think of. These are hard working muscles, with very dense fibres, best suited for roasts, thinliy sliced sandwich steaks, and cutting into strips for stir frying. These muscles are long and are layered with lots of connective tissue (sinew, gristle, etc). These are the toughest cuts of all but when cooked long and slow the connective tissue is softened and melted and the resulting dishes are really flavoursome and juicy. Theses are our favourite cuts of meat and we find they’re long gone before we even look at the “prime cuts”. These cuts are best suited for braising, pot roasts and stews and curries, with the exception of blade steak, which is the tastiest steak for grilling, but does contain some sinews. It is often said that these are the most challenging to cook, but they are really the easiest; simply put the ingredients into a pot or casserole dish, put it on the stove or in the oven at low heat, and walk away. To make sure your meat is cooked to perfection use a meat thermometer. Check the temperature of the beef or lamb just before the end of the estimated cooking time. Insert the thermometer into the thickest part of the meat, away from bone. For a really juicy roast, take the meat out of the oven just short of the desired temperature, the internal temperature of a large piece of meat can rise 5-10ºC as it rests. To check steak or chops you can also use the finger test. Don’t forget to rest the meat for at least half the cooking time!